This faucet can be installed on holes from 7/16" to 1 3/4" in diameter. If you're drilling a hole for the faucet, 7/16" or 1/2" is best. If you have an existing hole up to 1 3/4" inches, it will work fine, but be careful to center it properly on larger holes. The faucet comes with a small bit of 3/8" plastic tubing inserted next to the handle, where the faucet spout will go. It's there to protect the handle during shipping. Leave it there during installation until the faucet is securely positioned on your sink. 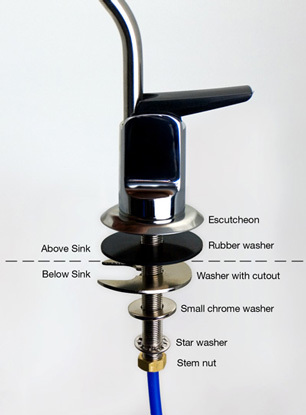 Begin by inserting the metal escutcheon, first, and the larger black rubber washer, second, onto the faucet stem. These are the only two parts that go on top of the sink. Insert the faucet stem into the hole and position the handle as desired. When we install locally, we usually mount the handle facing the side rather than the front or back so that it's easy to reach, but there are no laws about which direction the handle is positioned. It's your faucet, so point it the way you want it. Once the spout is installed, it can swivel a full 360 degrees. The “star washer,” also called a “lock washer.” There is no up or down. Tighten the stem nut with a 7/16" open end wrench to secure the faucet in place. Note: Unless you have very long arm or are willing to reposition the faucet as you go, this is a two-person job: one person holds the faucet in place, while the other tightens the stem nut. When the faucet body is secured, use pliers to pull out the small bit of 3/8" tube from where the faucet spout will go, and insert the spout in its place. You're finished. Just attach the blue tube to the outlet of the final filter of your drinking water system.